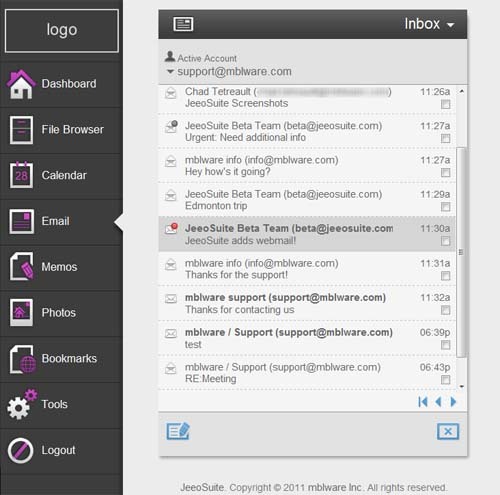 A few weeks ago we let you know about a new app for BlackBerry from mblware called JeeoSuite that is currently in private beta testing. 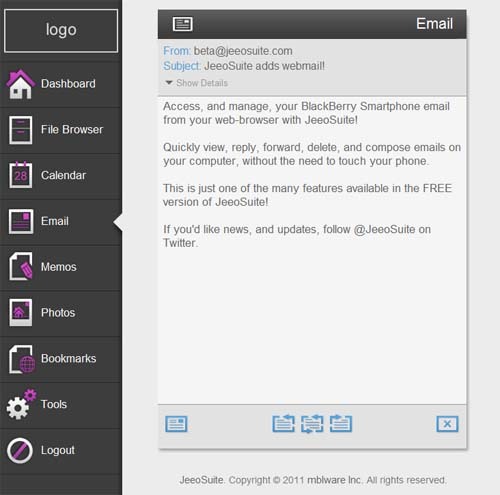 JeeoSuite is a wifi web-portal for your BlackBerry, and it's well on its way to becoming one of those "must have" apps that all BlackBerry users are going to want to get their hands on. I'm anxious to try out the new features! According to the JeeoSuite Twitter account, all of these features will be available in a free version, with a pro (premium) version to be released later. If you would like to sign up for beta testing, you can do so at the link below and you can check out the rest of the features and screenshots after the break! 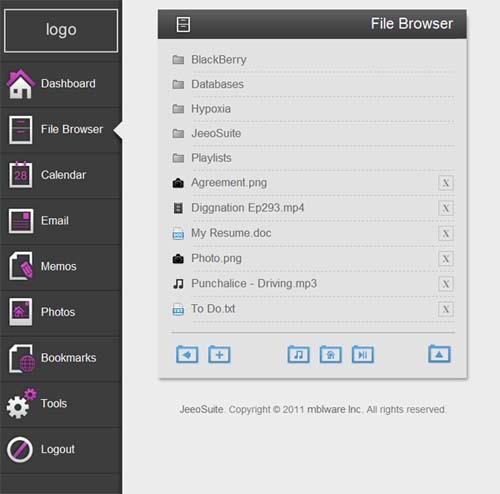 File Browser: Access your SD Card and Device Memory. Upload, Download, even stream media over Wifi to your computer web-browser. Security: Upload / Download permissions can be quickly toggled right in the app for added security. Optimize Memory: Never pay for a Memory Cleaning app again! 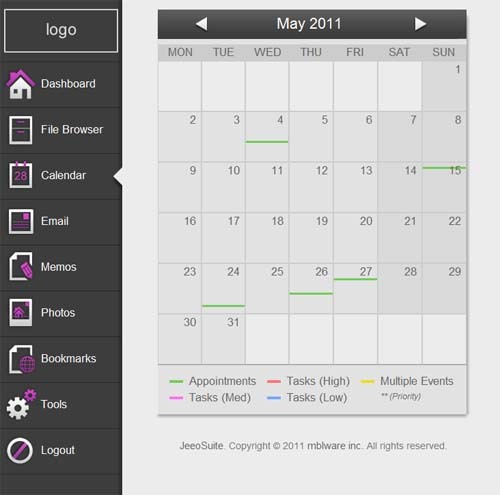 Free up memory with the click of a button in JeeoSuite. 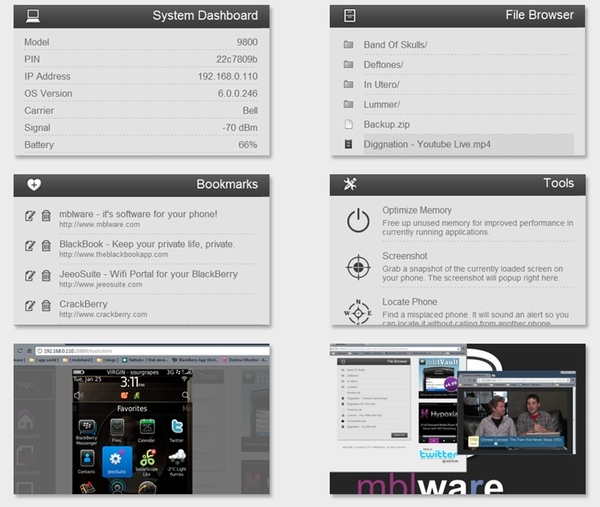 Screenshot: Take a snapshot of the current screen on your phone. Screenshots appear in your computer web-browser allowing you instant access. Locate Phone: Nothings more frustrating than trying to find where you left your phone. JeeoSuite will send out an audible alert so you can track it down. Bookmarks: Create and Edit Bookmarks. Take them with you where-ever you go and browse them on any computer. Dashboard: View your phones vital stats like Memory Usage, OS Version, Battery Life, IP Address, GPS Location, and more in the System Dashboard.